What is Asure Payroll and Tax Management? Asure Payroll and Tax Management is an easy-to-use and easily navigable solution. It places its innovative features, such as tax filing and reporting forms, within easy access of users for expedient workforce management. With Asure Payroll and Tax Management module, businesses can fill up forms expeditiously and without errors through the assistance of a payroll wizard. This ensures that payroll processing is done correctly to save time. Moreover, Asure Payroll and Tax Management software provides real-time reports based on different factors and metrics. This lets businesses understand the financial aspect of their operations in-depth so they can make better informed decisions. Asure Payroll and Tax Management guides users through every step of filing tax forms for their employees. The software makes simple and complex calculations while eschewing further complicated programming and additional steps. This payroll wizard also ensures that the necessary fields have the correct information inputted so that payroll processing is expedited and simplified. Asure Payroll and Tax Management automates various steps in the finance department’s workflow. Regardless of the business’ tax jurisdiction, distribution, filing, and tax reporting is made less arduous for a more meticulous compliance. Asure’s application makes certain that businesses are aware of all the financial goings-on in their companies. That is why the payroll and tax manager module is equipped with a general ledger that is directly connected to the chart of accounts. This enables the solution to import data as well into the organization’s preferred accounting system so that owners, executives, and managers are always prepared to make intelligent financial decisions. Asure Payroll and Tax Management offers more than 450 standard reports to be utilized by users. This affords them the ability to generate analytical and ad-hoc reports on demand, allowing decision-makers direct access to in-depth information. With Asure Payroll and Tax Management, the burden on HR is eased. That is because the software provides employees with a self-service portal wherein they can view their individual payroll and tax information, file time off from work, and more. If you are considering Asure Payroll and Tax Management it could also be a good idea to check out other subcategories of Best Tax Software collected in our database of SaaS software reviews. Companies have unique needs and requirements and no software platform can be ideal in such a situation. It is useless to try to find a perfect out-of-the-box software app that meets all your business needs. The intelligent thing to do would be to adapt the system for your special needs, staff member skill levels, budget, and other aspects. For these reasons, do not hasten and pay for well-publicized leading applications. Though these may be widely used, they may not be the ideal fit for your unique requirements. Do your research, look into each short-listed application in detail, read a few Asure Payroll and Tax Management reviews, speak to the maker for clarifications, and finally settle for the app that presents what you need. 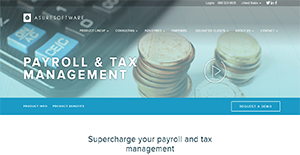 How Much Does Asure Payroll and Tax Management Cost? Asure Payroll and Tax Management’s SMB and enterprise pricing information is available only upon request. Contact the company for more details, and ask for your quote. We realize that when you make a decision to buy Tax Software it’s important not only to see how experts evaluate it in their reviews, but also to find out if the real people and companies that buy it are actually satisfied with the product. That’s why we’ve created our behavior-based Customer Satisfaction Algorithm™ that gathers customer reviews, comments and Asure Payroll and Tax Management reviews across a wide range of social media sites. The data is then presented in an easy to digest form showing how many people had positive and negative experience with Asure Payroll and Tax Management. With that information at hand you should be equipped to make an informed buying decision that you won’t regret. What are Asure Payroll and Tax Management pricing details? What integrations are available for Asure Payroll and Tax Management? If you need more information about Asure Payroll and Tax Management or you simply have a question let us know what you need and we’ll forward your request directly to the vendor.